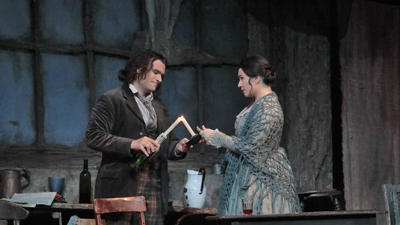 There’s a reason La Bohème has been done more often at the Met than any other opera: Puccini’s enticing music perfectly conveys the enchantment of young love, and the numbing sorrow of tragic death. The delectable Viennese soprano Hilde Güden is Mimì, the poor seamstress who falls in love with her neighbor Rodolfo (the American tenor Eugene Conley), only to succumb to tuberculosis. The beloved Robert Merrill is the painter Marcello.